Since the Edward Snowden story hit the news in June of 2013 with information about how the United States government has been conducting mass surveillance on its own citizens I have become much more aware and interested in the topic of privacy. After marching in the Restore the 4th protest rally in NYC, I was beat (left)! It was over 100°, but that didn't stop several hundred protesters from marching from Union Square all the way down to the Federal Building on Wall Street on July 4, 2013. 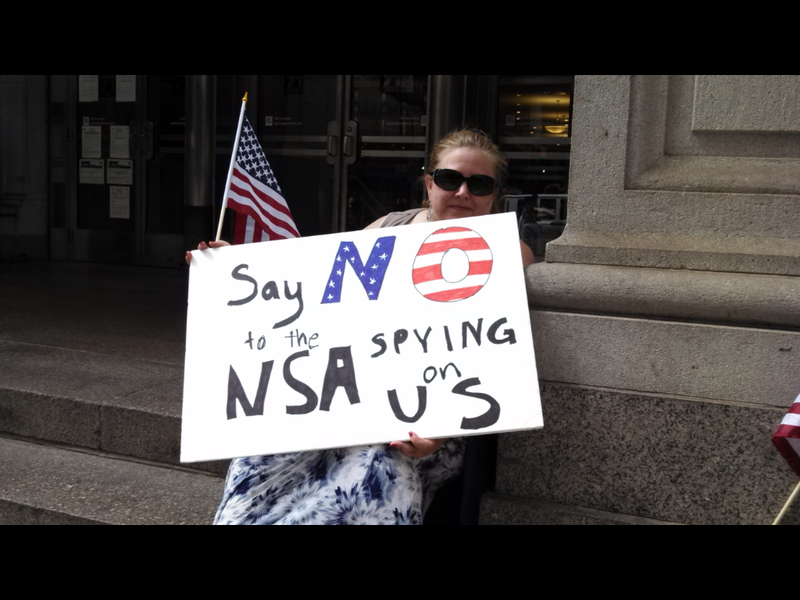 More than 100 rallies happened that weekend across America to protest the NSA surveillance on American Citizens. Why does privacy matter so much? "We do nothing wrong when we make love or go to the bathroom. We are not deliberately hiding anything when we seek out private places for reflection or conversation. We keep private journals, sing in the privacy of the shower, and write letters to secret lovers and then burn them. Privacy is a basic human need." This is the loss of freedom we face when our privacy is taken from us. This is life in former East Germany, or life in Saddam Hussein's Iraq. And it's our future as we allow an ever-intrusive eye into our personal, private lives." This is just the tip of the iceberg, for more about why privacy matters and how it is the cornerstone of democracy, please visit the links below. Signal Encrypted instant messenger & calling without having to change your numb (see also Security Tips Every Signal user Should Know)... and now Signal is available for the desktop! GPG for Journalists - Windows edition | Encryption for Journalists | Anonymous 2013 from anon108 on Vimeo. These are a basic instructions on how to protect Source-Journalist communications from being intercepted and read when they transit the internet using a technique called Public Key Encryption (PKE). By following these instructions, you'll allow any potential source in the world to send you a powerfully encrypted message that ONLY YOU can read even if the two of you have never met or exchanged contact information. We'll be using GNU Privacy Guard (GPG) through the "gpg4win" front-end program and focusing on emails as the transmission medium, but once you've created your ciphertext, you could send it any way you want: email, IM, blog post, Skype, etc. The Right2Privacy wiki I created, I've posted more info and resources on the American Virtue Project wiki (under construction).